I have never done a martial art before, are there beginners courses? Beginners are welcome at any time, sessions are open to all! Just come along and say hi whether you are a complete beginner, have done other martial arts or are returning TJJF grade. Wear loose clothes like tracksuit bottoms and a T-shirt and make sure you bring a water bottle, we get hot and bounce around a lot. No jewelry or wristbands please. Jitsu is a sport, like all sports, pain is involved, but we train in an extremely safe and progressive environment where injuries are very rare and we only push you to your limits, no further. We also have first aiders in the clubs. Yes, we don’t care who you are, while jitsu can look brutal, and it can be, it uses the attackers energy to our advantage. We will teach you many different techniques to defend yourself from a range of attacks, then you can pick and choose your favourites as they work for you. Yes, we like to think so, but it does depend on your idea of fun. Come try it for free, and if you don’t like it, at least then you know that and hopefully in that two hours you will have learnt a little. Does it cost a lot and where do my monies go? We think we are the cheapest martial arts in the area, please let us know if we are not. This doesn’t mean we are rubbish, we just don’t have the overheads of other clubs. We don’t have to pay for the room hire and the instructors teach for love not money. The Jitsu Foundation is also a ‘not for profit’ organisation and only has a couple of staff so we are well set to teach quality systems for little cost. Your monies go to insurance, upkeep of the small amount of equipment we have and sponsoring you in any events we go to. I’m not a student, can I train with you? The club is open to all those over 16, so yes, please come down have a chat. I have a disability, can I train? Yes, within your limits, we will do our very best to help you to learn what you can in a safe, practical and personal way. What do I gain from this martial art? Skill, confidence, leadership, self awareness, the list can go on, but the longer you do it, the more you will change, people will see the change in your posture and attitude in your normal life and you will start to look like someone who is confident and knows how to handle themselves, massively reducing the chances of an altercation in the first place, which is the best thing for everyone. It’s best to arrive 10 minutes before the session starts, to change and have a chat with everyone. We begin with a warm up (some cardio and strength training), and then some falling practice (learning how to roll around and fall from a throw safely). In the main session the instructor demonstrates a technique, and we pair up to practice together, then more demonstrations, more practice, and so on. Usually there is some pressure testing at the end, to see how well we can apply what we’ve learned. We then repair to the pub. Do I need to train every day? Please don’t train at Jitsu every day, twice a week is fine, three times a week is keen and once a week will get you started if that is all you can do, but like all sports, if you want to see significant improvement 4 hours (2 sessions) a week is perfect. To start with you can grade every three months or so, but you need to be good enough to pass, we do not give you a new belt because you turned up to a grading. If you are good enough to pass each grading in the shortest time period you could get your black belt in about 3-4 years, but most people are happy not to rush this process. Do I need to buy the kit and insurance? You can get away with two weeks without our annual £30 insurance policy, after this time you will need to pay this to train. The Gi or uniform is the only other thing you will need and you can train without one until your first grading which takes about 3 months to get to. We do advise you to get one asap just so that your clothes don’t get damaged in training. The Gi should last around 5 to 10 years at least. Is there a social aspect to the club? Oh yes, going for a drink after training is almost compulsory, we spend two hours trying our best to knock each other out, its only fair to go to the pub for a nice chat and a hug afterwards. We also like to have separate social events both within the club, in the south east region and nationally. Are you part of a larger organisation? 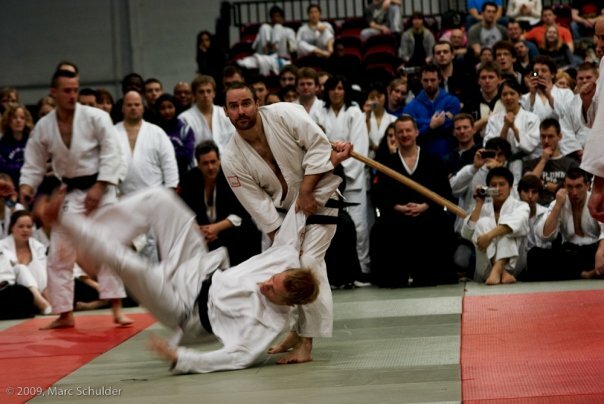 Yes, we are part of The Jitsu Foundation with clubs all over the world, we are a very large organisation. Just in the Brighton area we are lucky to have two clubs and five instructors to teach you all sorts of different aspects of the art, the more instructors you can have the broader and better your skills will become. We are here and The Jitsu Foundation are here. Jitsu, we are still around! Seriously though this depends on who you are, your skill level, how far you are willing to go and likewise for your opponents. However, we will teach you defences from weapons and multiple attackers from very early on, something most other martial arts leave until it is way too late.